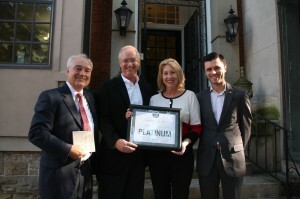 Chuck Lohre, Ez Housh, Laure Quinlivan and Andy Holzhauser pose with the LEED Platinum Certificate for the camera of Brewster Rhoads. July 8, 2013, Cincinnati, OH – greensource Cincinnati announced today that it has been awarded LEED® Platinum established by the U.S. Green Building Council (USGBC) and verified by the Green Building Certification Institute. LEED is the nation’s preeminent program for the design, construction and operation of high performance green buildings. Please join us in celebrating our latest achievement, "LEED Platinum," Wednesday, August 21, 2013, 4:00 to 6:00 p.m. Open House. Presentation of certificate, cocktails & hors d'oeuvres will be served. Tours of the building will be provided. Please register on our website http://www.greensourcecincinnati.com/leed-platinum-certification-celebration-event/. 19 East 8th St., Cincinnati, OH 45202. Questions? Please contact: Rhonda Bailey 513-685-8051, rbailey@greensourcecincinnati.com. In 2008, company president Ez Housh had the idea to purchase an old building in downtown Cincinnati, renovate it to LEED Platinum standards for energy-efficiency, and give people a place where they could go to see “green” technology in action. Thus greensource Cincinnati was born. What began as an idea to use the first floor of the building as a “showroom” quickly blossomed into a robust technology showcase on all 4 floors. Manufacturers and technology partners heard about the concept and the most viable renewable technologies were hand-selected for space in the building. “Congratulations to our Eighth Street neighbors greensource on achieving the highest rating for LEED buildings – LEED Platinum. This is not a surprise as they continue to strive for excellence in promoting green building practices, materials and education. As a green building advocate I am proud to have them in our community”, said Andrew Plogstead, Senior Associate, GBBN Architects, Inc.
LEED Certification of greensource Cincinnati was based on a number of green design and construction features that positively impact the project itself and the broader community. Greensource Distribution, (dba greensource Cincinnati), is a manufacture’s representative for several companies. These companies include: Schneider Electric (APC) (Square D), SubZero Engineering, Vycon, Carel, ACR , Global Velocity and Above Air Technologies. They deal in critical power and cooling applications, primarily in the data center environment. Their territory goes from central Ohio south and includes the state of Kentucky. greensource Cincinnati provides engineering assistance, equipment selection, project management and service contracts for the products that they sell. Their sales channels include distributors, IT resellers and contractors and verticals include healthcare, manufacturing, higher education, government, financial, entertainment and co-location facilities. The Washington D.C. based U.S. Green Building Council is committed to a prosperous and sustainable future for our nation through cost-efficient and energy-saving green buildings. With a community comprising 80 local affiliates, more than 18,000 member companies and organizations, and more that 167,000 LEED Professional Credential holders, USgBC is the driving force of an industry that is projected to contribute $554 billion to the U.S. gross domestic product from 2009-2013. USGBC leads an unlikely diverse constituency of builders and environmentalists, corporations and nonprofit organizations, elected officials and concerned citizens, and teachers and students. Buildings in the United States are responsible for 39% of CO2 emissions, 40% of energy consumption, 13% water consumption and 15% of GDP per year, making green building a source of significant economic and environmental opportunity. Greater building efficiency can meet 85% of future U.S. demand for energy, and a national commitment to green building has the potiential to generate 2.5 million American jobs. The U.S. Green Building Council’s LEED green building certification system is the foremost program for thedesign, construction and operation of green buildings. Over 100,000 projects are currently participating in theLEED rating systems, comprising over 8 billion square feet of construction space in all 50 states and 114 countries. By using less energy, LEED-certified buildings save money for families, businesses and taxpayers; reducegreenhouse gas emissions; and contribute to a healthier environment for residents, workers and the largercommunity. USGBC was co-founded by current President and CEO Rick Fedrizzi, who spent 25 years as a Fortune 500 executive. Under his 15-year leadership, the organization has become the preeminent green building, membership, policy, standards, influential, education and research organization in the nation.